The photo was taken in 1972. Ground work for the construction of the towers begins in 1966. 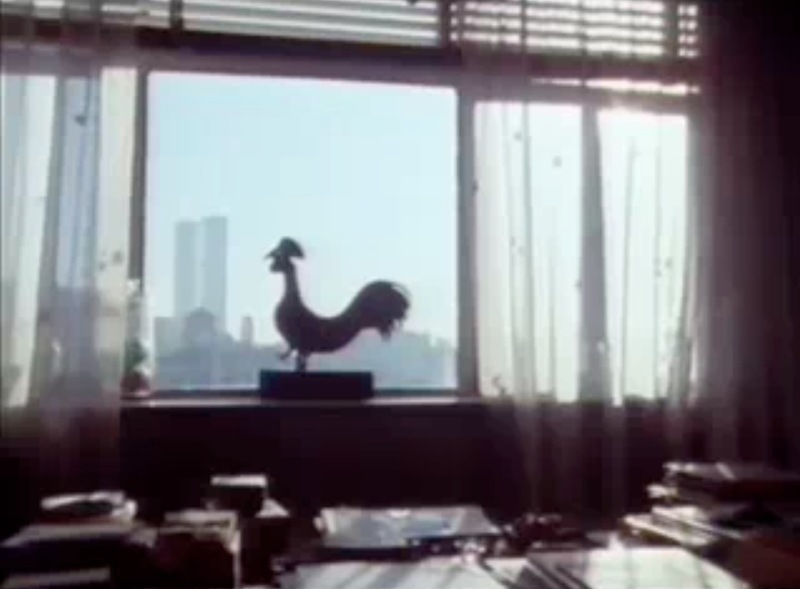 The first tenants began moving in the buildings on december 1970. 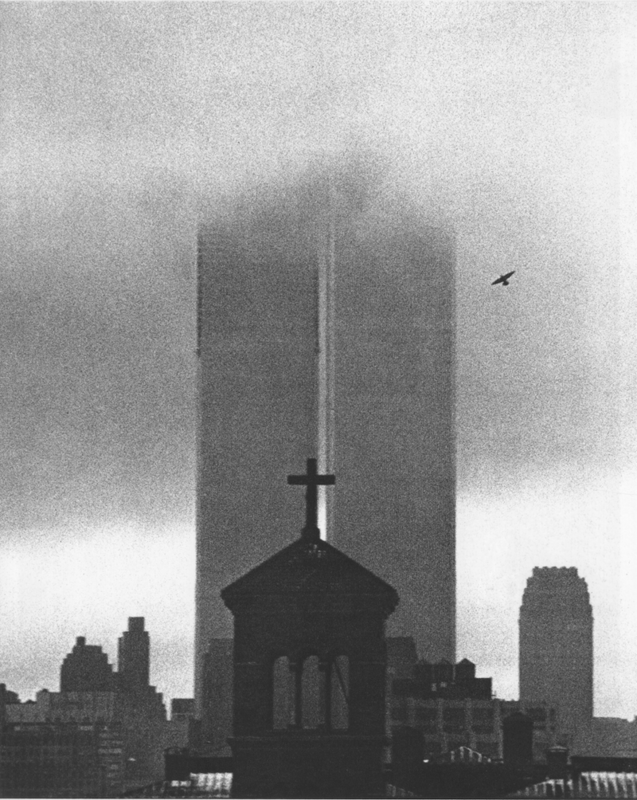 The actual dedication ceremony for the World Trade center was held on April 4th, 1973. For more see PBS: Timeline: World Trade Center (1942-2002). 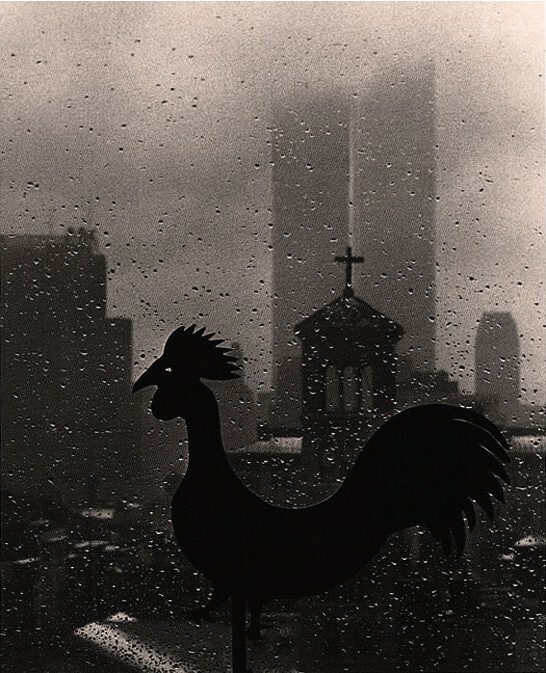 If I’m not mistaken, André Kertész took this photo from the window of his own apartment in New York, as seen below. 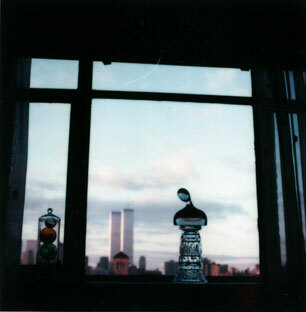 In the distant background, the Twin Towers are easily identifiable. In the middle ground, barely discernible in this image, is the church with the triangle roof where the cross must be installed. 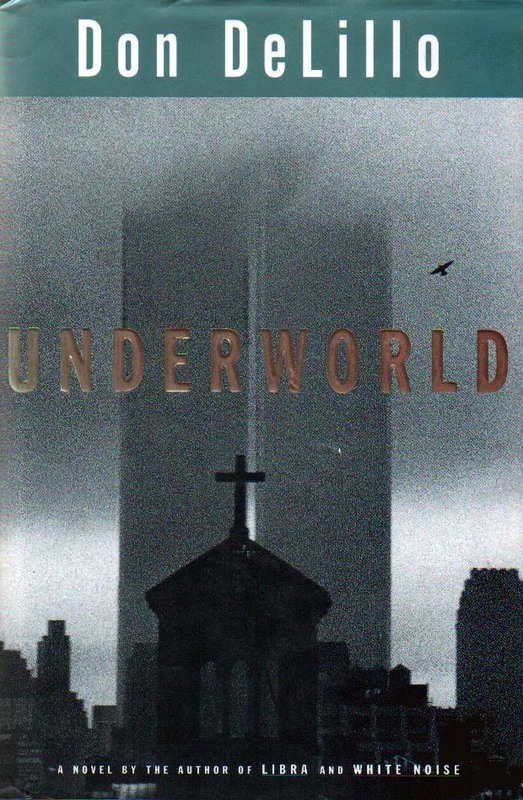 The iconic photo also appears on the cover of the American editions of Don DeLillo’s novel Underworld since it was first published in 1997 (Scribner, Google books, Amazon). Official website for the Estate of André Kertész (curated by Robert Gurbo). There’s a link inviting visitors to “Search for pictures now” but as of now it is broken (a typo in the URL address). It’s supposed to link to the Higher Pictures Gallery. Here’s a link to André Kertész’s collection at the gallery. From February 6 to May 15, 2005, The National Gallery of Art in Washington D.C. held an exposition about André Kertész. Although the exhibition is no longer on view at the gallery, one can explore related online resources listed at The National Gallery of Art website. Samething at the Stephen Bulger Gallery. For the exhibition André Kertész: Seven Decades (December 18, 2007 to April 13, 2008) The J. Paul Getty Museum put up a page with related online resources. In 1928, Kertész took a series of photo of Meudon, a “quiet Paris suburb”. The photo is commented in BBC series Genius of photography (specifically in the episode “Fixing the Shadow”). A related excerpt can be watched online (Flash is required). The International Center of Photography held an exhibition about André Kertész from September 16 to November 27, 2005. One can still browse some photographs, read a bio or download the press release. The Staley+Wise Gallery has a collection of 14 photographs by André Kertész. Finally, Wikipedia as quite a rich article about André Kertész.